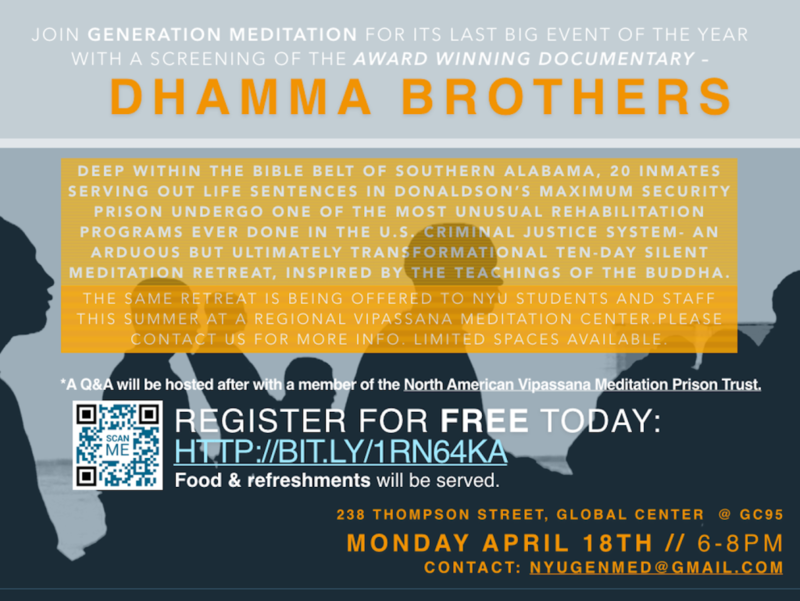 You are cordially invited to a free screening of the award winning documentary “Dhamma Brothers” at NYU. Set deep within the Bible Belt of Southern Alabama, the film follows 20 inmates serving out life sentences in Donaldson’s maximum security prison as they undergo one of the the most unusual rehabilitation programs every conducted in the U.S. criminal justice system- an arduous but ultimately transformational 10-day silent meditation retreat, inspired by the teachings of the Buddha. The event is open to the public and will feature a post-screening Q&A session with a representative of the North American Vipassana Prison Trust. Sign up on Eventbrite here: https://www.eventbrite.com/e/dhamma-brothers-screening-at-nyu-tickets-23191674924.